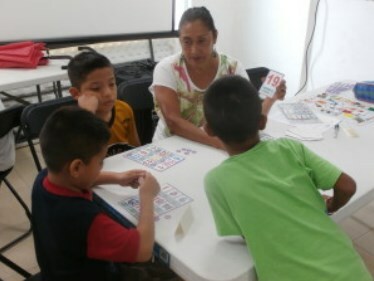 Rain has been falling heavily for days now in Playa del Carmen but the KKIS volunteers are still coming to help with our literacy and English programs. We arrived at school on Tuesday only to discover that the government had cancelled all school classes for the day. About 15 students had showed up anyway so we spent time in very small groups which was much less noisy and the kids got more of our attention. We started with conversation: Hello, how are you? I’m fine. How old are you? as we do every class. Then we moved to a Vocabulary Concentration game in which cards with pictures and the matching written word were all turned upside down on the table and kids tried to match the cards. Very challenging, but fun! Volunteers have also been going into the school three days a week for a couple hours to get the kids really engaged with the English language Curriculum and computer program by Brillkids called Little Reader, which is a part of a Scholarship by EEECF through LLI-Mexico . It is the vocabulary they have introduced with which we are playing games. This entry was posted in Mexico and tagged BrillKids, Children, English, Foundation, institutions, Joy Koller, KKIS, Little Learner Initiative, Little Reader, LLI, Mexico, school. Bookmark the permalink.